Here at Kenneth Installations, we manufacture all of our units so that they can be personalized to fit your bedroom and take advantage of all space. 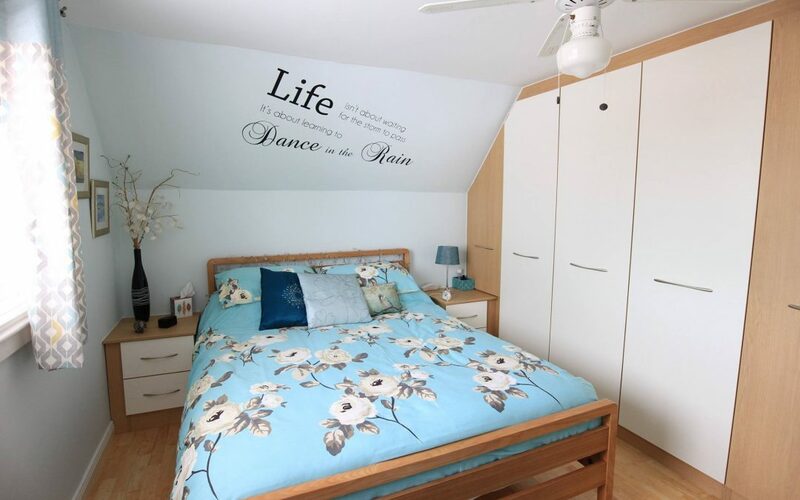 This means that we can fit units into places where you yourself may have not imagined to be possible, For example look at this bedroom which has been fitted with slanted wardrobes to take advantage of the shape of the ceiling and Provide more storage. We use Articad to design and demonstrate our finished design of you bedroom. We upload the sizes of your room to the program and then design it from there we will then call you into the office to view our design and to make any changes to it. Our bedrooms here at Kenneth installations are fitted to exact specifications to ensure that we are making the most of all space in your room, like in this photograph of a bedroom we completed for a customer the robes run into a bed side cabinet making the most of the space and to add a stylish look. Create a lovely, relaxing stylish bedroom designed to your own specification giving you a space easy accessible and practical. Allowing you to add your own personal touch to it, neutral colours make this bedroom ideal for adults or children alike. Infilling to the ceiling finishes this bedroom perfectly. Like what you see? Get in touch with Kenneth Installations for your free no obligation bedroom quote.